Following a hard loss which saw the Yankees hardly fall to the Astros, the Yankees looked to secure a huge series win over a formidable AL opponent. However, despite the recent success of Luis Severino in his last start against the White Sox, Severino fell victim to the explosive offense of the MLB leading Astros and the bats provided no support either, as hitter after hitter was unable to produce in the 8-1 loss. Starting the game, after a Gardner lineout, Judge doubled on a line drive to right field, followed by a Gary Sanchez walk. This put runners on first and second with only one out, giving Gregorius and Ellsbury chances to get some offense going. Instead, they both struck out and ended the inning on a sour note. The Astros also had a scoring opportunity in their half of the inning with runners on second and third with two outs, but former Yankee Brian McCann struck out swinging as Severino got out of a jam. Another scoring opportunity presented itself in the second as the Yankees had runners on first and second with two outs after Tyler Wade and Clint Frazier drew themselves a pair of walks, but Brett Gardner lined out to once again end an inning with runners on. The Astros on the other hand, decided to capitalize in the bottom half of the inning, as former Yankee Carlos Beltran was not as willing to help his former team as McCann was and lead off with a double, followed by a Marwin Gonzalez homer and doubles from Yuli Gurriel and Josh Reddick. Finally, Severino forced a ground out from Altuve, ending the damage at 3-0 Astros. The third and fourth innings were uneventful for the Yankees, as once again two runners were left on base in the third, and Carter, Wade, and Frazier went down in order in the fourth as Mike Fiers continued his decent outing. 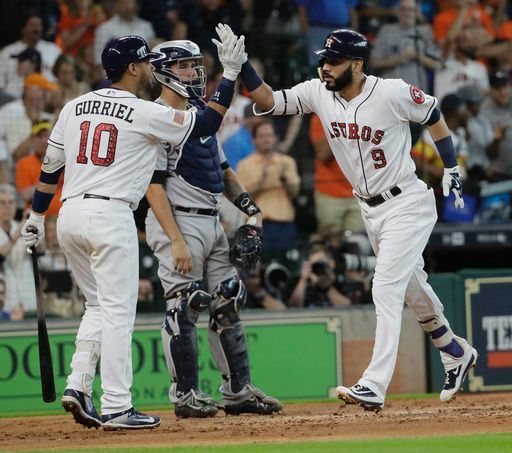 As for the Astros, Severino made quick work of them in the third, but resumed their offense in the fourth as they scored two more runs on a walk, a couple of singles, and a Carlos Correa double with brought two in, making the score 5-0. The top of the fifth brought a pitching change as Chris Devenski was brought in to replace Mike Fiers, perhaps giving the Yankees an opportunity to finally score off a new arm. However, Devenski sent the Yankees down in order as he struck out Gardner, Judge, and Sanchez consecutively. Severino finally showed some life in this inning though, as he sent down the three Astros which came to bat in the inning on a K and two fly balls to center and right field. The sixth saw three Yankees come to bat and three Yankees go back the dugout without reaching base. The Astros, on the other hand, finally forced Severino out of the game with a double by George Springer, who later scored on a Carlos Correa single off of pitching replacement Tyler Webb, bringing the score to 6-0. As the seventh rolled around, the Yankees once again saw a new arm come to the mound in the form of Michael Feliz, once again presenting a fresh start. The Yankees capitalized on this opportunity by going down in order for the third consecutive inning, including an unsurprising Chris Carter strikeout, a Tyler Wade lineout, and a Clint Frazier groundout. The offensive onslaught from the other club continued against the Yankee pitching replacement for Tyler Webb, Domingo German who allowed a single, threw a wild pitch, and then surrendered a two-run bomb to Yuli Gurriel which put the score at 8-0 at the end of the inning. 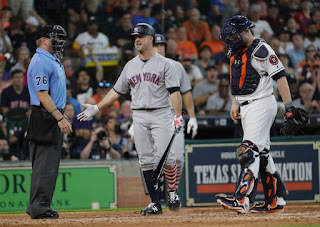 The eighth inning was déjà vu for the Yankees with two runners being left on base while the Astros went down in short order with just four batters coming to the plate. The top of the ninth finally saw the Yankees score a run off of a line drive from none other than Chris Carter which brought in Chase Headley from second. The inning promptly ended as Clint Frazier grounded into a double play and Gardner struck out to finish the game. The final score was Astros 8 and Yankees 1. This brings about a series loss due to a poor offensive showing and poor outing from Luis Severino. The Yankees will look to rebound as they prepare for a series with the Blue Jays starting tomorrow.